The deliberations of the Holy Synod were completed on 8th October 2010 with the completion of the reports to the Body of the Hierarchs by the Metropolitans and Bishops, who read their activities reports for the past year, or the representations of the Alexandrian Church at Inter-Orthodox, inter-ecclesiastical and inter-Christian dialogues, conferences and committees. 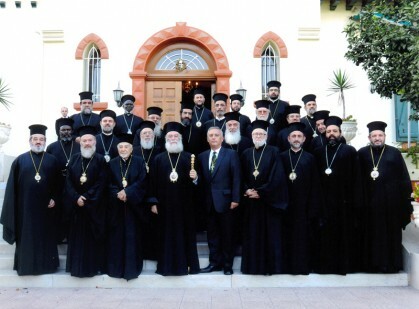 In concluding the deliberations of the Holy Synod, His Beatitude Theodoros II, Pope and Patriarch of Alexandria and All Africa, having read the letters sent by the newly elected Metropolitan Nikiphoros of Central Africa and Bishop Ioannis of Mozambique, in which they gratefully accept their election, thanked all the Hierarchs of the Alexandrian Throne for their tireless effort and arduous work which they undertake on the African continent, emphasizing that at the centre of the missionary activity is still the spiritual education and quality of development in Christ of the life of our suffering African brothers and sisters, as well as the care and concern of the orphaned children, the combating of disease and education. In reply, His Eminence the Elder Metropolitan Paul of Memphis, praised the tireless paternal care of the Venerable Primate for the clergy and Christian fullness of the Church of Alexandria. At noon His Excellency the Consul General of Greece in Alexandria, Mr. George Diakofotakis, hosted an official lunch in the Consular Residence in honour of His Beatitude and the Members of the Holy Synod.